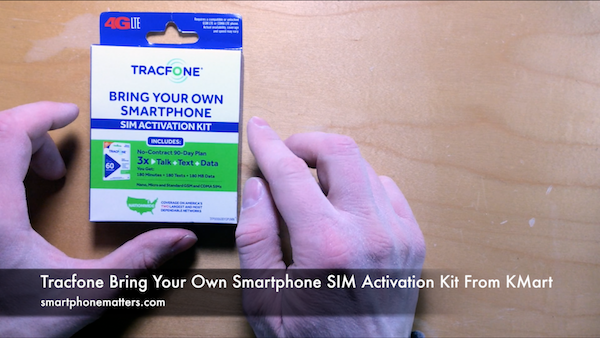 In this video I am going to show you the Tracfone Bring Your Own Phone SIM Activation Kit from Kmart. In a previous video, I showed you the kit that I bought from Walmart. The packaging for the kits are different but the content seems to be the same. I bought this kind for $29.99 in Kmart, last I checked the kits were discounted to $20 in Walmart. I bought this one because I didn’t have the time to try the extra distance to Walmart and I needed the Kit to set up a phone for someone. You can find this kit in the electronics section. The kit is on a security peg so your need a store associate to unlock it for you. Since the box is cardboard I just ripped it off the peg and no employees were around. I took it to the front of the store and checked out. The kit comes with a 90 day No Contract Service Plan with 180 minutes of talk, 180 texts, and 180 MBs of data. The kit comes with a nano SIM and dual SIM for the ATT GSM LTE network as well as a nano SIM and dual SIM for the Verizon CDMA LTE network. The dual SIM cards can be used either as a standard or micro SIM depending on what size SIM you need. The kit comes with a read me first, data usage, and terms of service documentation. The outside of the box the 90 service card attached. You’ll need to scratch off the silver stuff to expose the code. apparently as of March 2017, Tracfone no longer sells the sim cards. I only found out after I contacted them a second time to ask, “where’s my card?” (they said they’d mail to me). Only then did this employee contradict the other who said they do sell them.